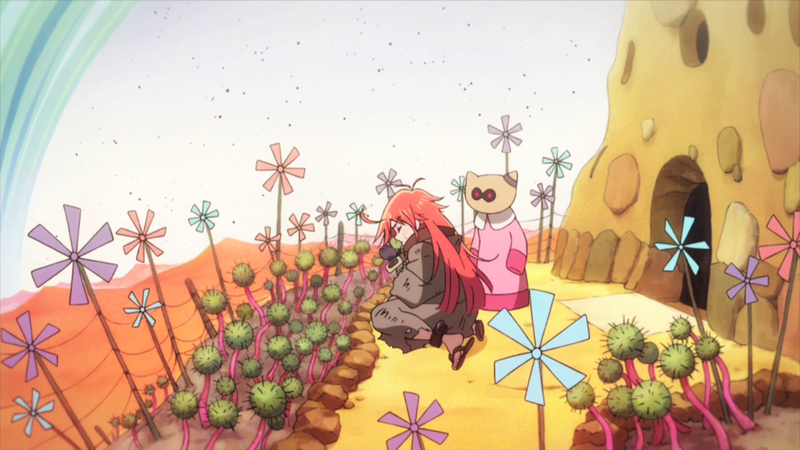 This episode delivered exactly what the preview promised – Flip Flappers’ first action recital featuring the work of many outstanding animators. Last week I talked about how each episode had been divided into two halves. Well, guess what happened – the majority of episode 3 took place in Pure Illusion! 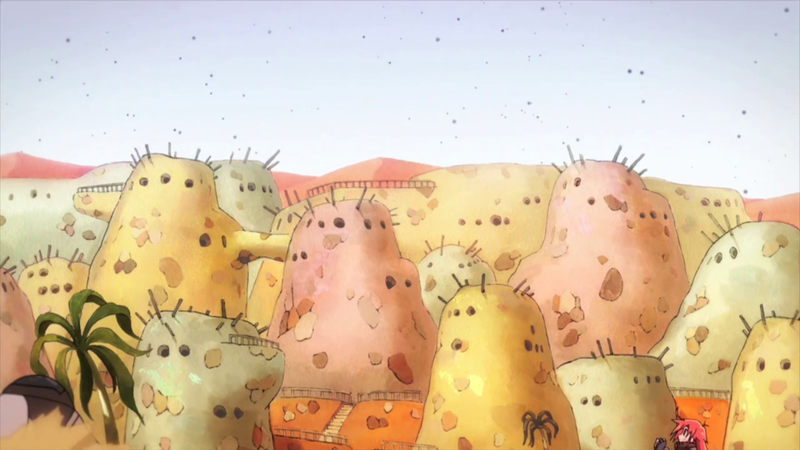 A departure from the previous two episodes on all possible levels, taking place in an unfriendly and desolate wasteland inhabitated by creatures that survive by sharing the little amount of water and potatoes they have among themselves. Quite the contrast with the previous episodes featuring what at least superficially were cheerful fairy tales. As a gang of bandits straight out of Mad Max attack the village, it’s more than obvious that this time things will take a different turn. There are still moments of incidental worldbuilding where we see the shy creatures show us their customs and the way their planet functions, but that’s not the main focus. Instead of simply discovering the new world, this time our duo landed on a setting with an ongoing narrative; it’s rather amusing how this lifeless planet is the one that feels more alive, compared to the previous ones that were eerily empty. Papika is forced to fight a brainwashed Cocona, who is now the leader of the bandits, and free her. 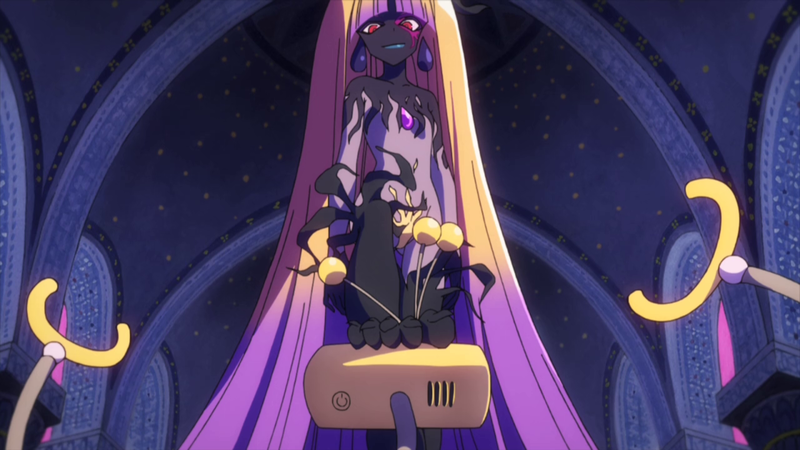 The actual villain and culprit of Cocona’s situation then appears – a little girl of a rather questionable and risque design, who fits unsurprisingly well into the decadent setting. Papika and Cocona undergo their first transformation and fight her together, but it’s Cocona’s schoolmate Yayaka and her twin colleagues who appear to deal the finishing blow to the villain’s monster form. This episode was clearly meant to hook the viewers with its hot-blooded action and introduce a bunch of new plot points. It’s way too early to tell whether I’ll like where the show is heading, but this episode was really enjoyable! The storyboard artist in charge was Kazuyoshi Yaginuma, the name which many of you may recognize from Disgaeamad’s feature on short anime where he wrote about his stunning work on Yama no Susume S2 episode 13. He more recently directed the attractively animated Pokemon Generations episode 4, another animation spectacle that stood out even within an outstanding production. The episode director Hiroshi Ikehata is somebody who’s used to working with young and talented animators; animation fans grew very fond of his for his astonishing episodes around the end of the 00s, and more recently he’s been in charge of entire shows that were full of noteworthy animation despite them being rather small productions. He’s directing Akiba’s Trip next season which will hopefully be at least as fun and well produced as his previous efforts. As I hinted last week, Naoya Wada had his animation direction debut on this episode. And what a debut that was! 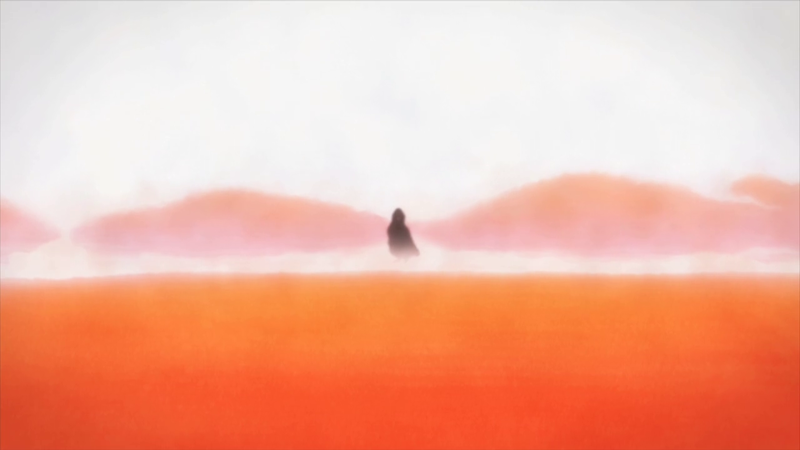 The art design of the landscape this week was comparatively simpler, as there’s only so much you can do with a desert; making arid scenery eye-catching seems like more of challenge than having vivid colors and flourishing life at your disposal, but this show managed it. 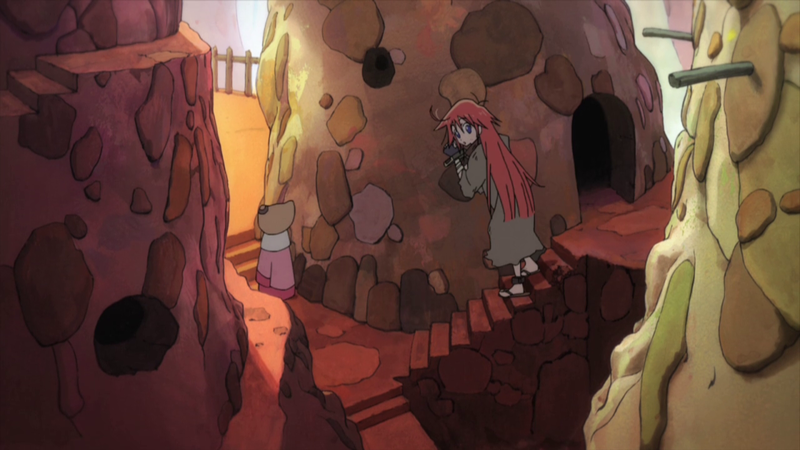 Thankfully we also got our fair share of interesting architecture from the village at the beginning of the episode. It’s almost as if the blobby shapes of the buildings were supposed to tell us that it is still Kiyotaka Oshiyama who is directing the series. His creative vision is instantly recognizable and still very fun to watch. The shining stars of this episode were the animators, however. The action scenes finally allowed them to go wild and it showed. 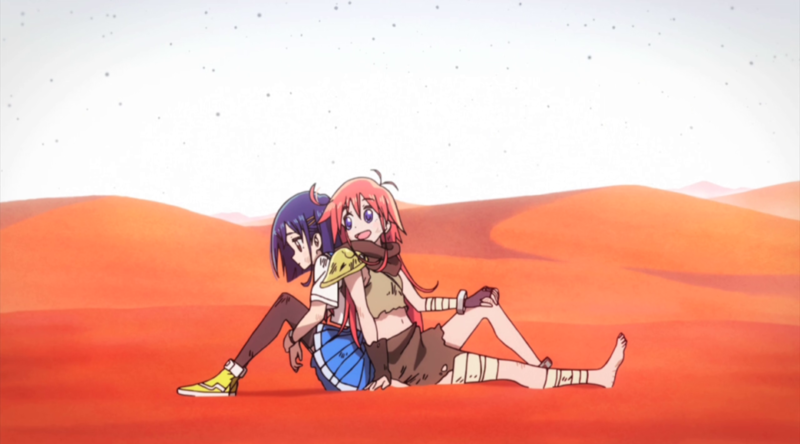 First we have the hand to hand combat action scene between Papika and Cocona animated by our dear artist_unknown, which featured some interesting smear frames and well timed movement. Following that was a Dragon Ball like showdown (incidentally, the episode is full of blatant winks at classic Toei properties) animated by the character designer and chief animation director Takashi Kojima. 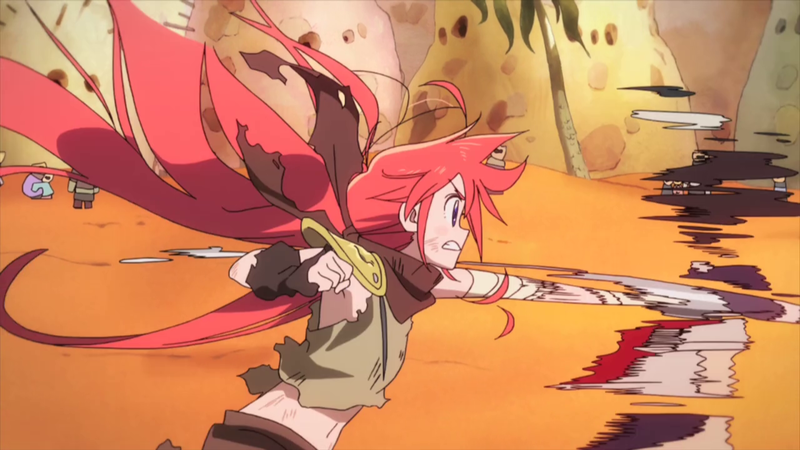 The sequence featured many impact frames, and four animators collaborated on the first shot of Papika – (in the episode order) Katsuhiko Kitada, Naoya Wada, Kojima himself and director Oshiyama. The lively and yet again rather risque transformation sequences were animated by Khara/Dogakobo affiliated animator Yumi Ikeda, who even got a special credit for her work. The action sequence following the transformation was possibly the episode’s highlight. Sadly the sourcing of this episode is basically non-existent so far, so I can’t tell you for sure who animated it. My guess would be that Hakuyu Go and Tatsuya Miki were involved. 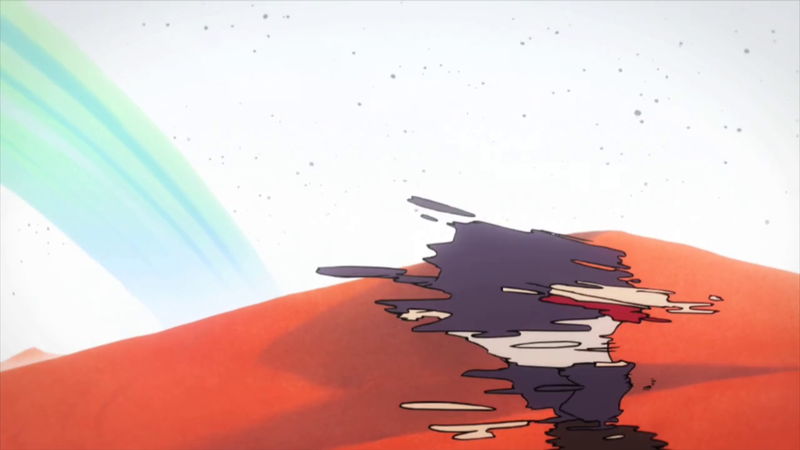 Kazuto Arai animated the part around Yayaka’s group’s attack and the explosion. 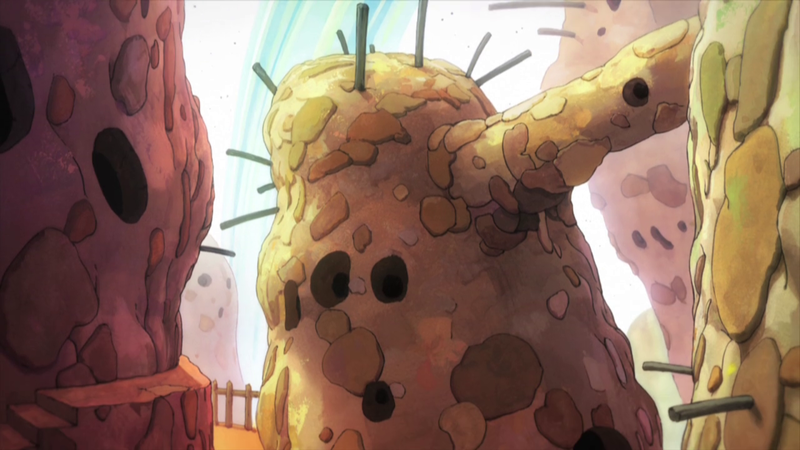 Other notable animators that worked on this episode include Ikehata’s regular Tamotsu Ogawa, up-and-coming Toshi Sada and Mob Psycho 100’s Yuki Igarashi. You know who I’d like here? Hiromitsu Seki, I think his hand would nail it so well in an action scene, or at least it does look like he could fit in very well. They’d probably have to get in contact with a different group of digital artists first, but that should be doable and something to look forward to. I wouldn’t mind getting some Nakayama animation now that he’s free from Macross.